Fin rot is one of the most common diseases in aquarium fish, but it is also one of the most preventable. Technically, fin rot can be caused by several different types of bacteria, but the root cause is always environmental in nature and is often related to stress. When fish are moved, subjected to overcrowding, or coupled with aggressive fish that chase them and nip at their fins, they are more susceptible to fin rot. Fin rot is a condition caused by either the Aeromonas, Pseudomonas fluorescens, or Vibrio bacteria. While relatively easy to prevent, fin rot can be difficult to cure once it does set in, particularly in the more advanced stages. If left untreated, fin rot will eventually kill the diseased fish and may infect all the other fish in the tank as well. In the early stages of fin rot, the edges of the fins will discolor, appearing milky on the edges. Often this change is so subtle that it goes unnoticed until fraying of the fins or tail begins. As the infection spreads, small pieces of the fins die and begin to fall off, leaving a ragged edge. Over time the fins become shorter and shorter as dead flesh continues to slough off the affected fins. The affected area may become red and inflamed, with bloody patches appearing as more tissue is eaten away. It is common for secondary fungal infections to develop along the raw edges of the fins. It is not unusual for Columnaris (cotton-wool) to also be present at the same time as fin rot, as both diseases can be caused by similar environmental factors. The most common causes of fin rot are poor water quality and improperly low water temperature. Overcrowding the tank, feeding outdated food or overfeeding the fish, and moving or handling the fish can also cause stress that leads to fin rot. Several antibiotics are effective in treating fin rot, but the root cause must be addressed to ensure the disease doesn’t return. Treatment should include a water change and careful examination of the aquarium conditions. If there is food debris, vacuum the gravel and take care to avoid overfeeding in the future. Start putting dates on your fish food, as it loses the vitamin content fairly quickly after it is opened. Feeding your fish fresh, high-quality food in smaller quantities is far better than frequent large feedings of stale foods. Check the pH and temperature of the water, and make sure it is appropriate for your fish. Once the root cause is corrected, antibiotics will usually cure the disease itself. Treatment with a drug that is effective against gram-negative organisms is recommended. The drugs chloramphenicol, oxytetracycline, and tetracycline are good choices. Always treat according to your veterinarian's instructions, as the preparations of fin rot medications can vary from manufacturer to manufacturer. It is particularly important to continue treatment for the length of time recommended, as ending treatment too soon can result in a re-occurrence of the infection. The use of aquarium salt will benefit livebearing fish but should be avoided in fish such as scaleless catfish, as they are quite sensitive to salt. Many of the measures to prevent fin rot are the same preliminary steps used to treat fish that have the disease. The best prevention against fin rot is good aquarium maintenance. Change the water regularly, vacuum the gravel, and monitor the water chemistry by having a regular testing schedule and documenting the results. This will allow you to quickly notice water chemistry changes that occur over time, giving you a chance to correct problems before they become serious. 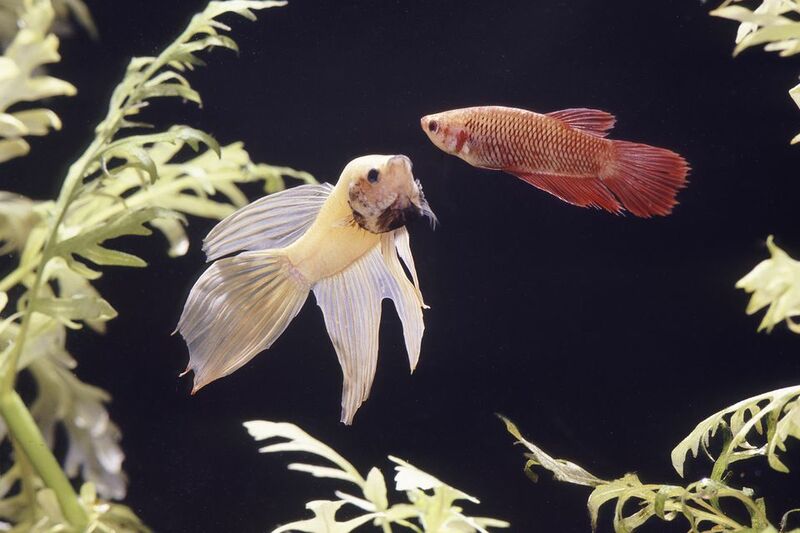 Do not overcrowd the tank, and watch for signs of fighting between fish that may damage fins. When feeding, keep the volume low. Overfeeding is the most common mistake made by all fish owners, and contributes to the poor water quality that fosters bacteria. Purchase food in small enough containers that it can be used up in one to two months. Take care when choosing tank mates for fish that have long flowing fins, as fin-nipping leaves fish more susceptible to fin rot. It is also important to keep water temperatures warm enough for fish with long fins, as low water temperatures will promote fin rot in these species.